Our guest bathroom has only one tiny up-high window. 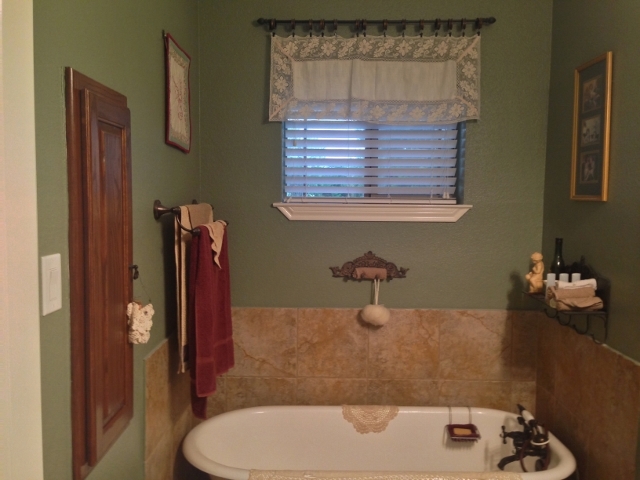 Although I love the light green-tea color we painted this bathroom, it does darken this small room a bit with such a small window offering the only light. I’ve used my grandmother’s dresser scarf – embellished by her hand – as a sentimental valance window covering so that the window will look finished while still allowing in as much light as possible. Since our guest bathroom comes complete with a pedestal sink & large vintage claw-foot tub I love how this sentimental old vintage scarf maintains the old-time look I’m after. 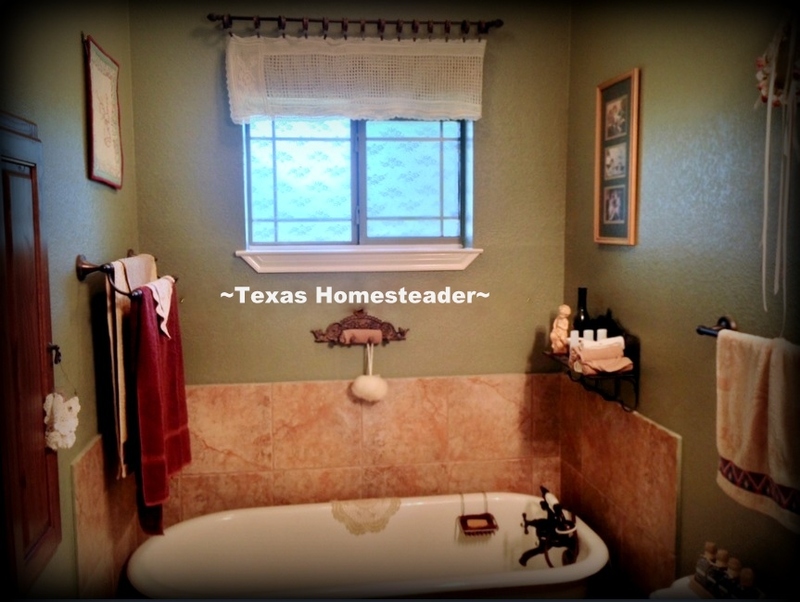 But since it is a bathroom after-all, there needs to be more privacy than just a valance. I wonder if there’s a way to keep the old-time charm & still offer both privacy & natural light. hummm…. 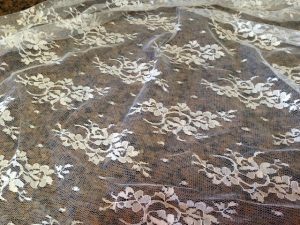 Then I read an idea on Annabel Vita about using lace & a simple paste made of cornstarch and water to decoratively cover the glass itself and make it opaque. The beauty of this method is that it’s completely reversible. So it would work very well for people living in temporary accommodations such as apartments or rent houses. 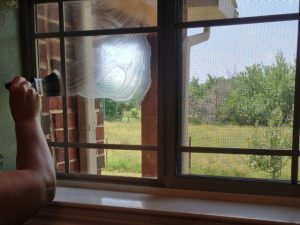 I’m reading that if you ever want a clear window back that a sponge with hot water will dissolve the corn starch and you simply pull the lace off and clean the remaining residue off the window and it’s like it was never there in the first place! Ever since I read about this window treatment I’ve been pretty anxious to try it and woo-hoo today’s the day! Several weeks ago in preparation for today’s mission my aunt helped me search for the perfect lace. I wanted something very lightweight and with a subtle pattern. I would have really liked to have found said lace as a window panel or veil at a garage sale so I could have bought it used which would make my crunchy-green heart very happy. but everything I saw was either too heavy or had way too much pattern. So to JoAnn’s Fabrics we went, and I found this bundle of loveliness. I knew it would be perfect for my project. 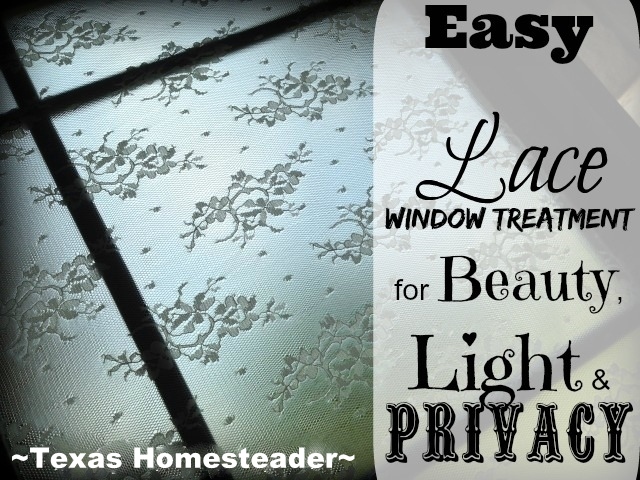 The reader’s digest version of this project: Wash the window, cut a template, cut the lace, mix up the paste, slather it on window, attach lace, slather paste on outside of lace, DONE. So I began. I pulled out the lace and measured my window to make sure I had plenty of lace. I brought out a large paper feed sack to use for my window templates. But my handsome RancherMan told me that was doing it the hard way. He suggested I just trim any excess when the lace dries. Well, I thought, my man is usually right. Maybe I am doing it the hard way. Maybe I really can just trim the excess afterward. So I decided to give his way a go. Now that the lace is cut I make my cornstarch paste by adding 1 Tablespoon cornstarch to 1 Tablespoon cold water and stirring to blend it all in. Then I placed 1 and a half cups of water in a microwave-safe bowl and heated it to boiling and poured my cornstarch mixture into the boiled water, stirring to thoroughly blend it and allowing it to cool somewhat. The texture became much like a thin off-white glue. Now it’s show time! I take my cut lace pieces, my bowl of cornstarch paste and a soft-bristled paintbrush into the bathroom. Using a paintbrush I slather my paste onto my clean windows in a random pattern. I think a random pattern keeps any lines or streaks from being prevalent in your finished look. Then I position the lace on the window and press to attach it. Finally I take my paintbrush and dip it in the cornstarch paste again and slather it on the outside of the lace to seal it all in, again in a random pattern. PERFECT! When the cornstarch dried I went in with another layer to more evenly cover the lace. It turned out perfectly. Now all that’s left to complete is to trim the excess lace (eh hemm…) and I’m all done. I absolutely love the way it looks. It solves all my bathroom-window problems. I’s pretty, the lace lets in light, the window treatment offers privacy. And it still keeps the old-time look I love. I’m reading there are a few situations that aren’t ideal for this type of window treatment. Situations such as a location where the lace can get splattered and need to be cleaned such as over a sink. And I’d think frequent heavy steam might be a detriment to it as well. Of course the way I look at it is if you don’t like it, it’s easy-peasy to remove. All it takes is just a sponge and some hot water. So you really can’t lose, and nothing ventured nothing gained! Give it a try and let me know how you like it! 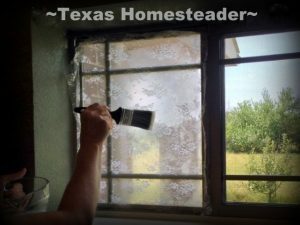 This entry was posted in Blog Posts and tagged Environment, Frugality, Make-It-Yourself on June 7, 2015 by Texas Homesteader. I would absolutely love to try this! I was wondering if mold would be a concern for this? I didn’t have any trouble with mold Chelsy, but mold in my bathroom isn’t typically a problem anyway. I suppose it could be like any other surface in your bathroom if mold is typically a problem in that locale, perhaps lessened with adequate ventilation or use of an exhaust fan? BUT, it’s completely reversible so if it did end up being a problem down the road it can be easily removed. I love this idea!! I have a bathroom window that is right on my back deck!! Really a great and unique idea. Thank you for sharing with us at #HomeMattersParty. We would love to have you again this week. Wow, NEVER would have thought of that! What a great option for renters. Thanks for sharing with Simply Natural Saturdays. What a beautiful idea. I didn’t know this was possible. I think this looks so pretty instead of just a lace curtain or those fuzzy windows we sometimes have. I am hosting a link party which is called Sweet Inspiration. Now if anything is sweet it is this idea. Come and join us, we run Friday till Tuesday. I never would have thought to add lace to a window, but this adds a great touch of design to any room. What a fantastic idea that’s simple and fun to add just the right accent to home decor! Wow. I would have never thought about this! I love the way yours turned out. I’m wishing I had a window to do this to, but sadly all my windows are still a little too public (and facing an elementary school!) to risk the lace being a little too see through. Thanks for posting this on the #sustainablesunday linkup! I so want to try this! Thanks for sharing on My 2 Favorite Things on Thursday – Link Party!! Hope to see you again this week!! Love having you!! Pinned!!! I love this look and like the fact is reversible. I’m trying to figure out which window I can do this in! This is so genius. I’ve been looking for something like this for forever. Thanks for posting. Hello from Mostly Homemade Mondays. I have 2 side windows by my front door that I think this will work wonderfully. I am going to start looking for lace at the many Estate Sales I go to. Thanks for the tip!